Sisters Bernie and Libby Simmons run a catering business in their upstate New York town, and they’re ready and willing to handle any wedding–even one where the bride and groom have tails . . .
Susie Katz is known as the crazy cat lady of Longely, New York, and goes out of her way to earn the title, right down to her cat T-shirts and porcelain Hello Kitties. She’s a fanatic for anything feline. Humans, not so much. So when she decides to put up a tent on her property and hold an extravagant wedding ceremony for her two Russian blues, she makes sure to include a few two-legged guests–primarily to raise some hackles. All her favorite enemies will be there: her bird-loving neighbor, a rival cat breeder, a local animal rights activist, and the niece and nephew who stand to inherit her considerable fortune . . . if she doesn’t spend it all on cat tchotchkes first. Susie can’t wait for them all to watch as Boris and Natasha slink up the aisle in their very expensive diamond-studded collars, before everyone starts digging in to the poached salmon and caviar provided for the occasion by Bernie and Libby. But chaos erupts when a wedding gift is unwrapped and a mischief of mice jump out of the box–followed by the disappearance of all the pampered partygoers. Just a few hours later, Susie is stabbed in the back while searching for her missing kitties near the now-empty tent–and it’s up to the Simmons sisters to sniff out the killer . 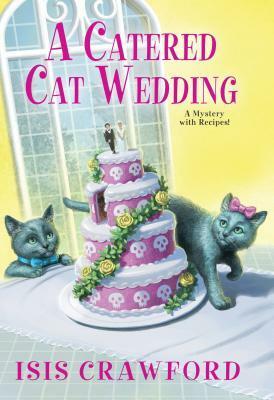 . .
A Catered Cat Wedding by Isis Crawford is a novel filled with humor, cats, and murder. An older woman is obsessed with her cats. She ends up spending a fortune on a cat wedding for two of her most prized cats. Yet just as the weirdest wedding is about to unfold, everything goes wrong. From there, the two sisters catering the wedding are taking care of a mice problem only to find the cat owner stabbed to death. This novel was full of laughs and utter chaos. I found the cat owner strange and her murder interesting. I loved the niece and nephew of the crazy cat lover. And the two main cats made this story even more fun to follow. I did not like Suzie, the cat owner, at all. Her personality and way with spending made me dislike her. The sisters catering the wedding, Bernie and Libby were kind even to Suzie. The plot was crazy but the murder inside caught my full attention. I enjoyed reading this new mystery.